CHIC-NILES ROGERS PRESENTS THE CHIC ORGANIZATION-BOX SET 1/SAVOIR FAIRE. Considering how influential Chic proved to be, and the commercial success and critical acclaim they enjoyed, it’s about time a lovingly compiled and lavish box set celebrating their career was released. After all, for their first three albums Chic could do no wrong. Their 1977 eponymous album was certified gold, while 1978s C’est Chic surpassed Chic, and was certified platinum. Then as disco crashed and burned, Risque which was released in July 1979, was certified platinum. Another five albums were released between 1980 and 1992, but Chic never recaptured the commercial success they enjoyed. However, the music Chic released and produced for other artists, continued to influence further generations of producers, including Daft Punk. Earlier this year, Niles Rodgers collaborated with Daft Punk on their 2013 album Random Access Memory, which included the huge hit Get Lucky. Suddenly, Chic were big news again. Soon, Niles Rodgers was playing the festival circuit with the latest incarnation of Chic. For a new generation of music lovers, they were able to hear a taster of what Chic in their heyday sounded like. 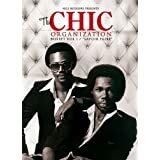 Realizing that their was a market for Chic’s music, Rhino recently released a “new” box set Niles Rogers Presents The Chic Organization-Box Set 1. However, all wasn’t as it seemed. I’ll tel you why, once I’ve told you about Niles Rogers Presents The Chic Organization-Box Set 1/Savoir Faire. Spread across the four discs that comprise Niles Rogers Presents The Chic Organization-Box Set 1 /Savoir Faire are forty-six songs. This includes tracks from Chic’s fifteen year career, plus just a few of the artists Niles Rodgers and Bernard Edwards produced. Among them are some of their best known productions, including Sister Sledge and Diana Ross. Then there’s a fifteen previously unreleased tracks. Granted there’s some hidden gems tucked away on Niles Rogers Presents The Chic Organization-Box Set 1 /Savoir Faire. Among them are contributions from Norma Jean, Diana Ross, Teddy Pendergrass and Fonzi Thornton. However, there’s a few unreleased tracks that might have been better remaining unreleased. They might be better lying unreleased in a record company vault. After all, Niles Rogers Presents The Chic Organization-Box Set 1 /Savoir Faire should be a celebration of all things Chic. Is that the case? Disc One of Niles Rogers Presents The Chic Organization-Box Set 1 /Savoir Faire opens with a stonewall disco classic, the original 12” mix of Everybody Dance. It’s Chic at their very best. This was a track from their 1977 debut album Chic. Dance-floor friendly and hook-laden, it’s a reminder of how potent the Bernard Edwards and Niles Rodgers’ partnership was. Two other tracks from Chic are Est-Ce Que C’est Chic and another classic Dance, Dance, Dance (Yowsah, Yowsah, Yowsah). Again, the 12″ Mix of this timeless disco classic has been chosen. Talking of classics, they keep on coming. Le Freak from 1978s C’est Chic, was one of Chic’s biggest selling singles. It reached number one in the US Billboard 100 and US R&B Charts. It sold over six-million copies. Talking of classics, there’s the 12” mix of Dance, Dance, Dance (Yowsah, Yowsah, Yowsah). It’s one of six tracks from C’est Chic. The other two are Chic Cheer, Savoir Faire, Happy Man and At Last I am Free. There’s also a unreleased outtake of Funny Bone (Previously unreleased outtake). These tracks are representative of Chic at the height of the powers. Back then, Chic could do no wrong, whether as a band or producers. The two other tracks on disc one of Niles Rogers Presents The Chic Organization-Box Set 1 /Savoir Faire are from Norma Jean’s 1978 album. Norma Jean was one of Chic’s backing vocalists. Her eponymous album was produced by Niles and Bernard. Sorcerer was one of the singles released from Norma Jean. It’s the 12” version that features on disc one. Saturday is the other track, with the Dimitri From Paris remix transforming the track to a near ten-minute epic. Overall, disc one of Saturday Niles Rogers Presents The Chic Organization-Box Set 1 /Savoir Faire is quality all the way. From the opening bars of Everybody Dance, right through to the closing notes of Funny Bone, Chic don’t disappoint. No wonder. During this period, they could do no wrong either as a band or producers. Their talents as producers were in-demand and soon, Chic would become the go-to-guys for artists looking for a producer to revive their career. That was the case with Sister Sledge. Before they teamed up with Bernard and Niles, their career was going nowhere. They’d released two of albums, but success eluded them. Then in 1979, Sister Sledge hooked up with Niles and Bernard. The result was We Are Family, which was certified platinum. It featured We Are Family, Greatest Dancer, Lost In Music and Thinking Of You.Dimitri From Paris works his magic on Lost In Music and Thinking Of You. These four tracks represent Sister Sledge at their best and reinforce why Niles and Bernard were so in-demand. Of the other artists on disc two, there’s a previously unreleased long version of Norma Jean’s Hold Me Lonely Boy. It’s something of a find and is worthy of its place on disc one. So is Sheila and B. Devotion’s Spacer. There’s also a previously unreleased outtake of Love Devotion. Surely, it would’ve made more sense to include the original version? This outtake will be interesting to fans of Sheila and B. Devotion, but can hardly be described as one of Chic’s finest moments, unlike the other tracks on disc one. I Want Your Love, Good Times, My Feet Keep Dancing and My Forbidden feature Chic at their best. Of this quartet, Good Times is a disco classic. Timeless, it’ll still fill dance-floors four decades later. Soulful, funk and dance-floor friendly, Chic were Kings and Queens of disco. Just like disc one, most of the music is a celebration of Chic at their best. As a band, they enjoyed their most successful period between 1977 and 1979. During that period, they released a trio of classic albums, Chic, C’est Chic and Risque. They also worked with some of the biggest names in music, giving their career a musical makeover. On disc three, this includes Diana Ross and Debbie Harry. As the eighties dawned, and disco was but a fleeting memory. Still, the anti-disco backlash was still being felt. Sister Sledge released their second Chic produced album Love Somebody Today. It featured Got To Love Somebody and Reach Your Peak. Sadly, despite its undoubtable quality, Love Somebody Today reached just number thirty-one in the US Billboard 200 and number seven in the US R&B Charts. These two tracks are a reminder of an album that’s a hidden gem. Diana Ross was one of the biggest artists Chic worked with. They produced her 1980 album Diana. Two of the singles from Diana feature on disc three. Upside Down and I’m Coming Out are stonewall classics and feature two of the best tracks on Diana. This wasn’t the only big name Bernard and Niles worked with in the early eighties. A year after producing Diana, Bernard and Niles were asked work with Debbie Harry. They wrote and produced her 1981 single Backfired. It’s a track from Debbie’s debut solo album KooKoo. Although Backfired proved to be a prophetic title, KooKoo was a huge commercial success, and was certified gold in the US and silver in the UK. Two of Chic’s vocalists feature on disc three. Norma Jean contributes the 12” version of High Society. Fonzi Thornton delivers a sassy, strutting version of She Works Hard For A Living. This version is the Niles Rodgers long version. What these two tracks show, is how important Chic’s vocalists were in the group’s success. Of the other five tracks on disc three, they’re all from Chic. Among them, are Rebels Are We and Chip Off The Old Block from their fourth album, 1980s Real People. Stage Fright and Burn hard are from 1981s Take It Off. By then, Chic were no longer enjoying the same commercial success. Chic were seen unfairly as “just” a disco band, and after the disco backlash, their record sales suffered. Still they were producing music that was innovative and genre-melting. Just it was no longer as fashionable. There’s some hidden gems tucked away on Real People and Take It Off. The other track on disc three is a previously unreleased outtake of What About Me. Given how Chic released eight albums and produced albums for numerous artists, there should’ve been more than enough material for a four disc box set. However, there’s some serious barrel scraping going on. Eight of the eleven tracks have been unreleased. This includes a trio from Johnny Mathis, who was jumping on the disco bandwagon with I Want To Fall In Love, It’s Alright To Me and Something To Sing About. These three tracks are really disappointing and are three reasons why disco received such a bad name. The 12” mix of Carly Simon’s Why isn’t exactly her finest moment. It was track from the soundtrack to the 1982 movie Soup For One. Just like the Johnny Mathis tracks, Why’s inclusion leads me to ask Why? At least some of the other unreleased tracks make up for these four tracks. Niles Rodgers remix of Teddy Pendergrass’ Dream Girl is a real find. It falls into the category of hidden gem. Why it’s never been released before is something of a puzzle. Another unreleased track is Fonzi Thornton’s fabulously funky I’ll Change My Game. It’s a welcome inclusion, on disc four. The remaining six tracks are from Chic. This includes the 12” mix of Soup For One. This shows another side to Chic. A fusion of electro, funk, jazz and post-disco Chic exploit a groove to its fullest. Then there’s Hangin’ On and I Feel Your Love Comin’ On from 1982s Tongue In Chic. You Are Beautiful is taken from the overlooked Believer album, released in 1983. It was the last to feature the classic lineup of Chic. The final two tracks on Niles Rogers Presents The Chic Organization-Box Set 1/Savoir Faire are Just Call Me and Will You Cry, two previously unreleased tracks. They’re a somewhat disappointing way to end the box set. After all, Chic have released and produced much better music than this. For three discs, Niles Rogers Presents The Chic Organization-Box Set 1/Savoir Faire looked like being the box set that celebrated the career of Chic. Things went awry on disc four, where the barrel was scraped somewhat. That’s a great shame. After all, there’s more than enough music to ensure that Niles Rogers Presents The Chic Organization0Box Set 1/Savoir Faire was crammed full of quality music. It should’ve been an album that’s all killer and no filler. Indeed, I could’ve put together five discs of music celebrating the career of Chic. Sadly, here it was a struggle to fill four discs. That’s not the worst of it. No. Back in 2011, a Chic box set released, it was only available in the UK as an import. That was Niles Rogers Presents The Chic Organization-Box Set 1/Savoir Faire. The problem with that box set was the sound quality. It didn’t do the music justice. Far from it. At the time the box set released, that was the gripe most people had with Niles Rogers Presents The Chic Organization-Box Set 1/Savoir Faire. So when Niles Rogers Presents The Chic Organization-Box Set 1/Savoir Faire was recently rereleased, the problems would be rectified. Were they? They weren’t. It’s the same version of Niles Rogers Presents The Chic Organization-Box Set 1/Savoir Faire that was released back in 2011. Looking at the box, it was made in 2010. The only difference is it’s no longer available as just an import. Sadly, the same problems persist. What could’ve and should’ve been a fitting homage to one of the most important groups of their generation is still to be released. Niles Rogers Presents The Chic Organization-Box Set 1/Savoir Faire came close to being the box set that pays homage to one of the most innovative, inventive and influential groups of the late-seventies and early-eighties, Chic. They were responsible for a string of timeless disco classics. Chic were equally innovative, inventive and influential as producers, working with some of the biggest names in music. Among them were Diana Ross and Debbie Harry. They also reinvented Sister Sledge and transformed their career, writing, producing on playing on their classic album We Are Family. These are just a few of the artists Chic worked with and whose careers were transformed. During that period, everything Chic touched seemed to turn sliver, gold or platinum. That’s why Chic deserve a box set that celebrates their career and pays homage to a group who were innovators. They pushed musical boundaries to their limits. Innovators describes Chic perfectly. Chic were one of the most influential groups of the last forty years. Since then, they’ve gone on to influence several generations of musicians and producers. Niles Rogers Presents The Chic Organization-Box Set 1/Savoir Faire could’ve been the box set that paid fitting homage to Chic. For three discs that looked like being the case, Sadly, that wasn’t the case. Instead, Niles Rogers Presents The Chic Organization-Box Set 1/Savoir Faire came up short and we’re still waiting for the definitive Chic box set.